Ferritin has been widely used as a biotemplate for size-constrained synthesis of various nanomaterials. The hollow cavity of this multisubunit cage-like protein provides an ideal environment for a mineralization process. 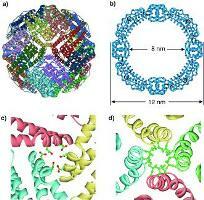 The protein cages of ferritin enable a good solubility and, in many cases, good physical and chemical properties of the resulting nanocomposites. The unmodified exterior surface of the protein cage remains accessible for further alterations, which expands the application potential of ferritin-templated nanocomposites. As an autogenous iron-storage protein for most organisms, ferritin-encapsulated nanocomposites have many inherited advantages for potential biomedical applications. With a survey of the ferritin research from the view of both biological and material science, this review projects research on this particular biomolecule from various viewing angles and hence, reveals some unexplored potential for biomedical applications of ferritin-templated nanomaterials.